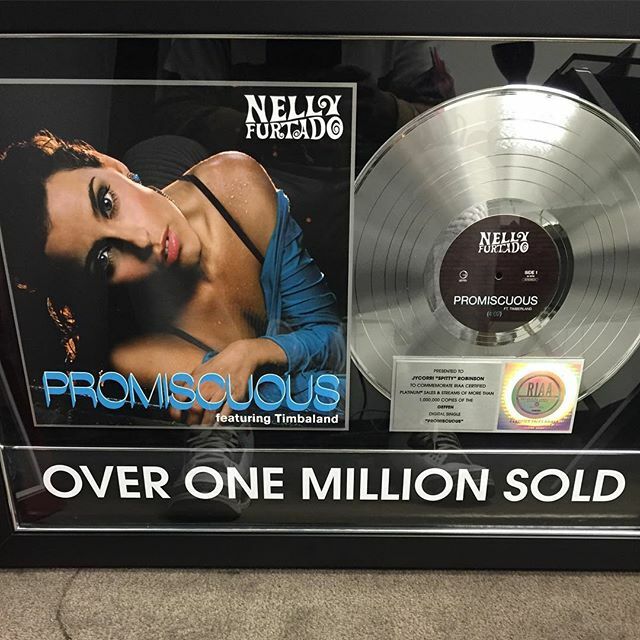 Back In 2006, Here is what was significant about "Promiscuous:"
"Promiscuous" is a song by Canadian singer Nelly Furtado from her third studio album Loose (2006), featuring Timbaland. The song was written by Timothy "Attitude" Clayton, along with Tim Mosley, Furtado and Nate "Danja" Hills. The song's lyrics, which were penned by Furtado and Clayton, feature a conversation between a man and woman who call each other promiscuous. The overtly-sexual song was released as the lead single from the album in North America in early 2006, and as the second single elsewhere in mid-2006 except in Latin America, where the single was released as the third single in late 2006. Explicit Lyrics - The lyrics of "Promiscuous" describe the two sides of the relationship that the song's protagonist deals with. It was one of the first songs Furtado wrote with labelmate Timothy "Attitude" Clayton. Furtado called their teamwork something she "had never done before" because she saw the writing process as "extremely freeing" because of his different approach and style. Clayton helped Furtado experiment with interpreting the "promiscuous girl" character and the two-sided relationship she is in. Furtado also described that in the process of writing lyrics "we were actually flirting, which is why the song is so playful" and that she and Clayton nicknamed the song 'TheBlackBerry Song', because everything we say in the song you could text-message to somebody". Because of the preponderant musical influence of artists such as Talking Heads,Blondie, Madonna, The Police and Eurythmics, whom producers Timbaland and Danja listened to during the writing of the album, "Promiscuous" takes inspiration from pop music of the 1980s. In United States, "Promiscuous" On 8 July it topped the Billboard Hot 100, becoming her first number-one single. It spent 6 weeks at the top spot and was replaced by Fergie's "London Bridge". It reached the top position on Billboard Pop Songs and Hot Dance Club Play chart. "Promiscuous" reached number twenty-two on the Billboard Hot R&B/Hip-Hop Songs and number thirty-six on Hot Latin Songs chart. The song was certified platinum by the Recording Industry Association of America (RIAA) for sales of 1,000,000 digital copies. It also made number three on the Billboard Hot 100 year-end chart and number forty-four on the decade-end chart. As of August 2009, the song has so far sold over 2,504,000 digital downloads in the United States. Danja, the producer extraordinaire talks about the Making Of Nelly Furtado's Hit "Promiscuous"
DANJA: "I had a beat playing. Tim walked in and said what came to him. he started doing the hook and added some drums. A lot of stuff we would start together, some he would start on his own and some I would start on my own. Then we'd come together and finalize it. "The funny thing about 'Promiscuous' is he had that record done before we started on Nelly, though he might have had her in mind for it when we made it. I don't remember if she was 100 percent feeling it or not. It was one of those, 'I like it but we're still getting ideas out.' In the end, that was the last song we completed for the album. It ended up being the biggest song on the album." Music Video - The song's Music Video was directed by Little X and features cameo appearances by Keri Hilson, Bria Myles, Sean Faris and Justin Timberlake. It does not follow a storyline and per Furtado's request, focuses on scenes with dancing and flirting because she wanted to recreate the song's indicative vibe, and took the opportunity to film a club video for the first time. Furtado said of the video, "It's that whole dance that goes on. There's that mystery there, the fun, playful sexiness, the verbal Ping-Pong game". Furtado and Timbaland cannot decide whether they want to begin dating or instead flirt with others on the dance floor. Their single performances are intercut with several scenes of a dancing crowd, and the lighting changes between blue, green, red, and yellow colors. "Promiscuous" premiered on MTV's Total Request Live on 3 May 2006, where it reached number one after spending twenty-one days on the countdown. After its debut onMuchMusic's Countdown, it ascended to number one for the week of 28 July 2006. At the 2006 MTV Video Music Awards, it was nominated for the Best Dance, Female and Pop Video Awards. The video was parodied by MADtv in a segment entitled "Syphilis Girl"; in the video, Furtado (Nicole Parker) is comically portrayed as having given Timbaland (Jordan Peele) the sexually transmitted disease, as well as on YouTube by the comedic group Train of Thought Sketch Comedy, where the video is parodied by troupe member Kaci and features a puppet version of Timbaland.